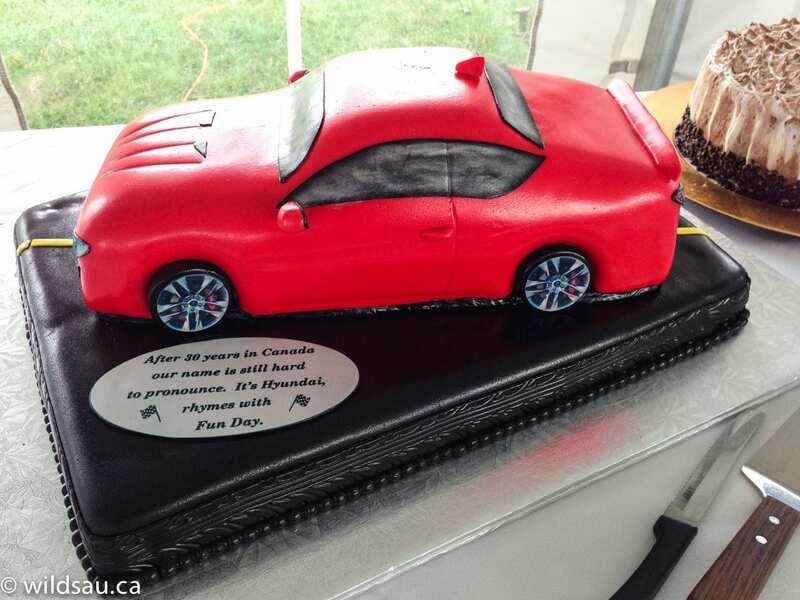 Hyundai Canada does something every year that goes beyond a normal press junket. Typically a regimented, focused and tightly scheduled event, pressers are fun to attend but rushed and you always feel as though you’re in a controlled environment. Frankly, you don’t have to look far to find exactly the aspects of the vehicle the manufacturer wants you to discover and experience. That’s all fine and dandy, and really I’m not complaining because they fly you to the location, wine and dine you and things are quite fancy-schmancy. But Hyundai has come up with an event, which they call Fun Day, and it takes things in a different direction. First of all, let’s get this out of the way. Fun Day is a multi-purpose name. It describes the point of the exercise – simply to have fun and experience some of their products. And secondly, it rhymes with their name. 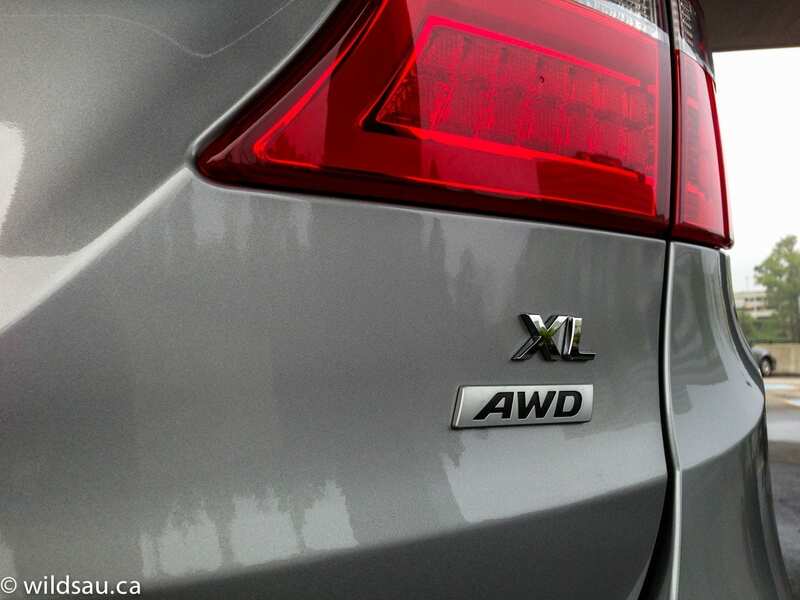 It’s Hyundai Canada’s 30th anniversary this year, and people are still coming up with inventive ways to pronounce their name. 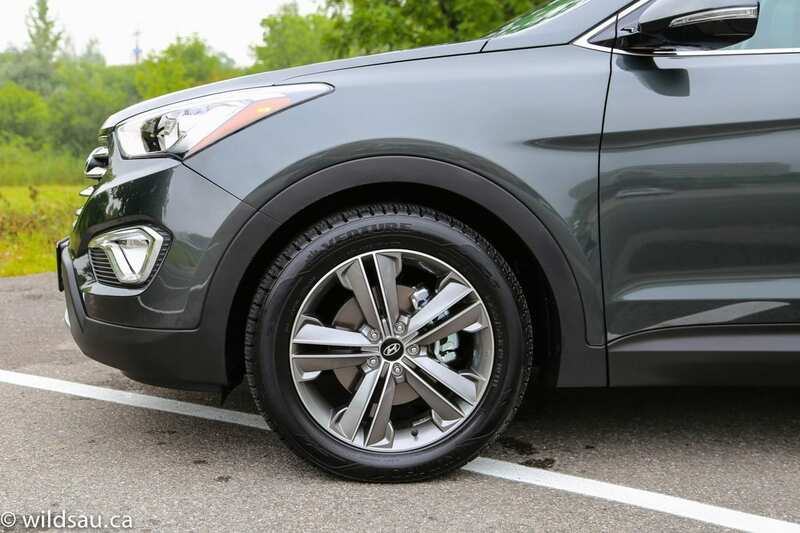 So remember – Hyundai rhymes with Fun Day. 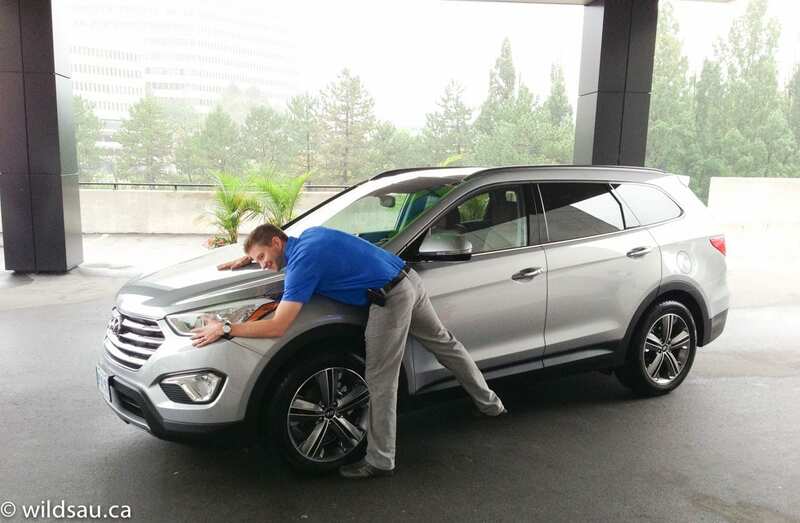 We arrived, staggered by our flight schedules, in Toronto on August 27th and were greeted by our Hyundai hosts. Patrick Danielson, Chad Heard and Oles Gadacz all met us for appetizers and drinks out in the courtyard behind our accommodations, the Westin Prince. After some mingling and banter, we were ushered inside (as it started raining – impeccable timing!) to an incredible meal of barbecued beef, lamb and chicken skewers, a lamb burger bar, a fantastic salad spread (but who’s going to bother?) and desserts to die for. Truth be told, I almost did die for them. I probably should have stopped with the third round. It poured throughout the night, dampening our spirits for what we knew was coming the next day. At a scrumptious breakfast (including some of the finest Eggs Bennies I’ve had), we were promised a short and sweet presentation. And they weren’t kidding. 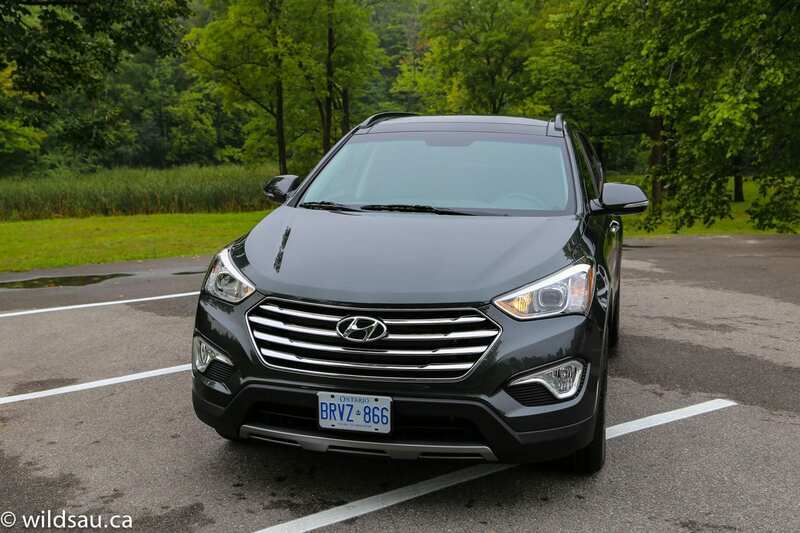 We were walked though Hyundai’s humble beginnings in Canada, through today where the company’s Santa Fe holds the title for AJAC’s SUV of the year. 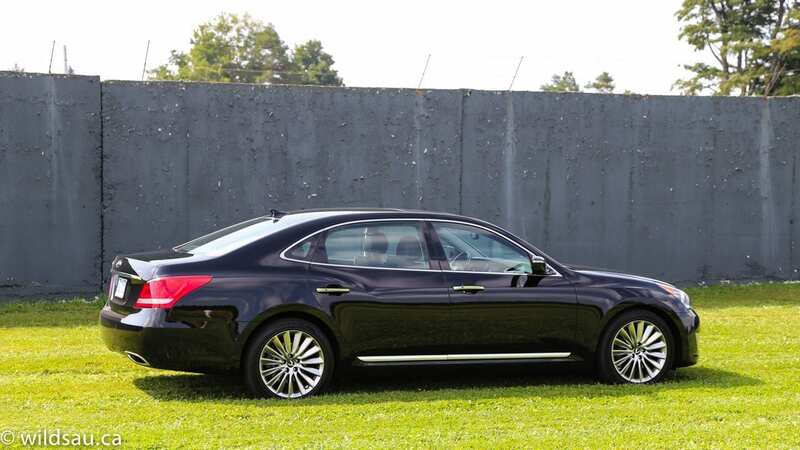 The past 30 years have seen this manufacturer come a long way, arriving where they are with their inspired “fluidic sculpture” styling and over 136,000 vehicles sold in 2012. Not bad! 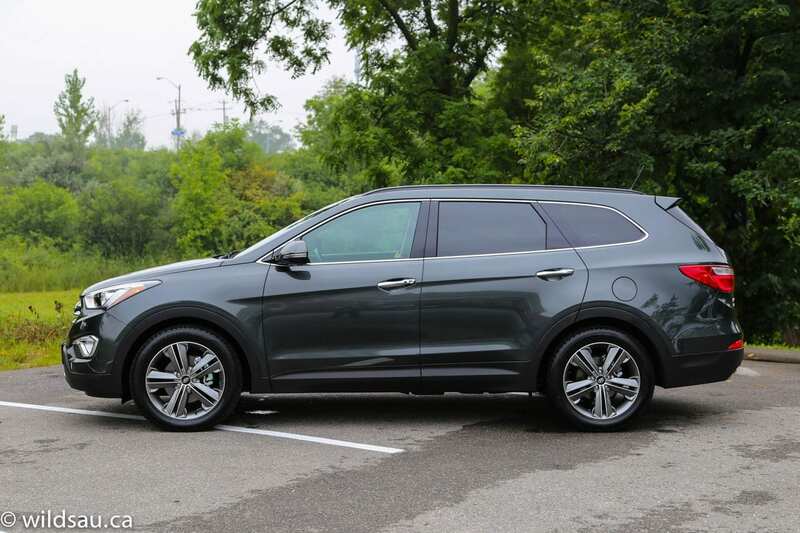 Afterwards, we gathered outside the hotel to be introduced to their latest offering – the plus-sized Santa Fe XL. 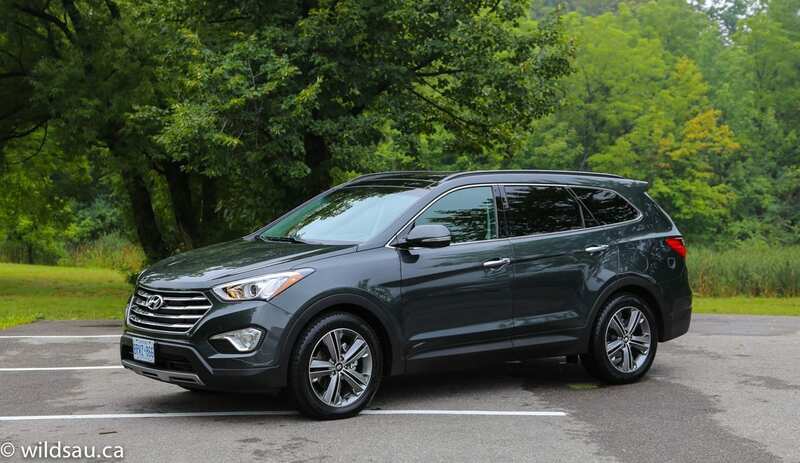 It builds on the success of the Santa Fe, adding size and capacity, with seating for seven passengers. A quick walk-around and then we partnered up. 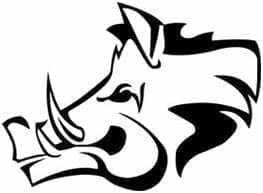 I connected with Jonathan Yarkony, a fine young man whose mind works in similar ways to mine, and we started our journey to our Fun Day destination – the Canadian Tire Motorsport Park (CTMP)! It’s an hour’s drive at least, and after a ton of laughs and off-side jokes (all clean, honey, I promise! ), we arrived. 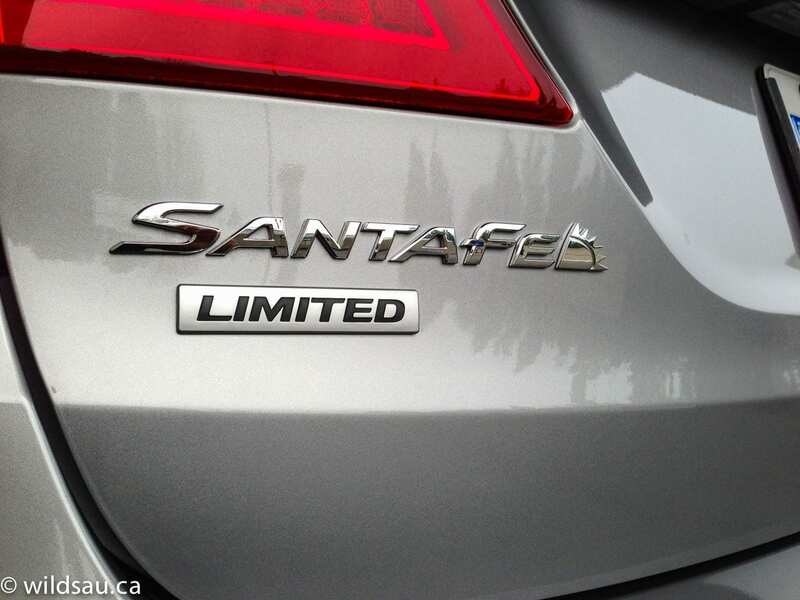 The Santa Fe gobbles up highway miles like a pro, remaining comfortable and composed throughout the trip. The second row is enormous, and feels even airier than most thanks to the enormous panoramic sunroof overhead. 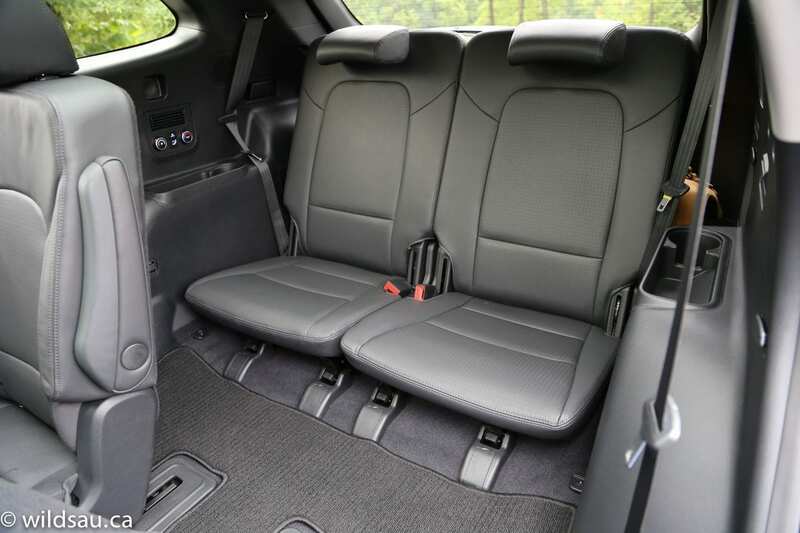 The third row, while nicely done, is for kids, dogs or amputees – leg room is limited. 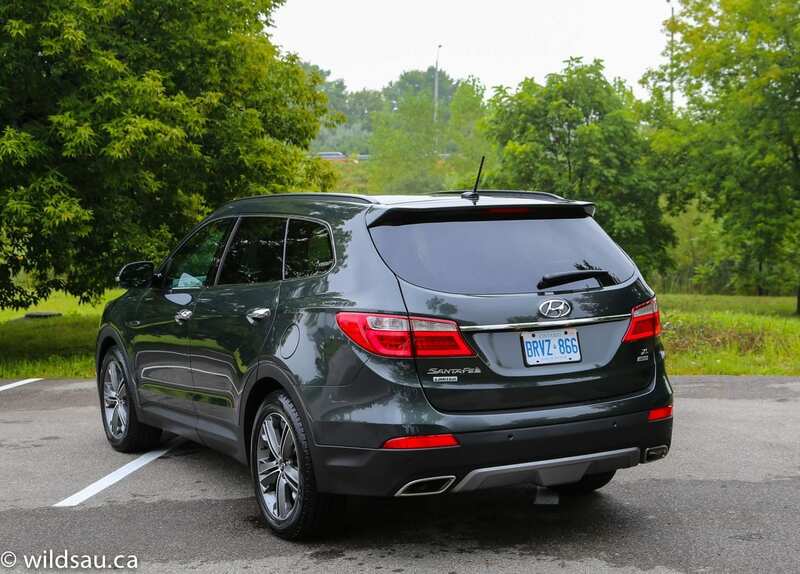 The styling is very handsome, and in my opinion, works even better than on the regular-sized Santa Fe. It hides the vehicle’s considerable bulk well. The heat was overwhelming for this Alberta boy. You know how we say we have a dry heat here? Well, it’s true. It was 29 degrees Celsius in Ontario that day, but well over 40 degrees with the humidity. Stifling and draining. We pulled up and were given a quick bird’s eye tour of the different things we could do that day. And then we were unleashed. No schedule. No rules. Just have fun. My kind of event, yo. 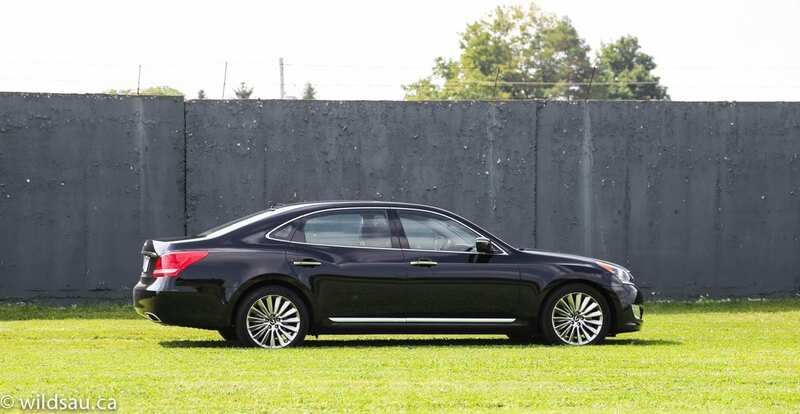 The first thing I did was got into Hyundai’s incredible flagship, the Equus. 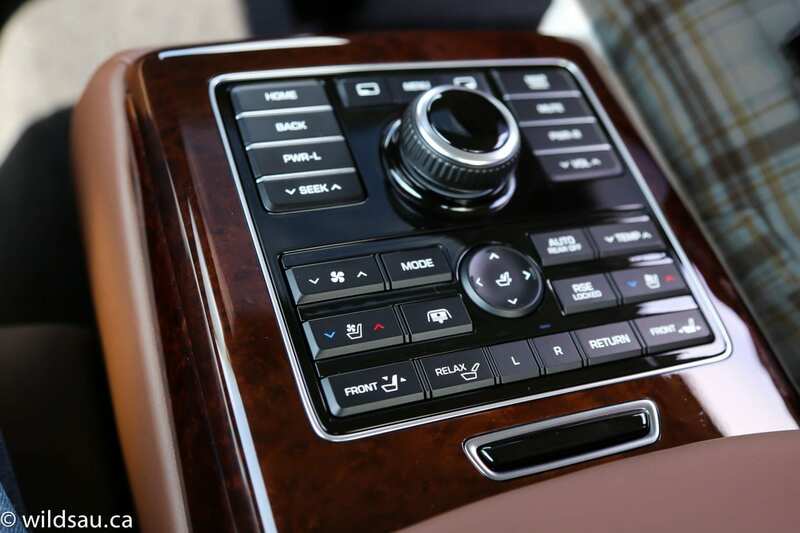 Its all-new interior is stunning, to say the least, and simply bristles with every single luxury and technology you’ve ever heard of. And then they add some more. Powered by a 429 horsepower V8, it’s a silken Eater of Highways. Yes, it’s nice in the city, but this is the ultimate road trip machine. Comfort parallels the best cars I’ve driven. 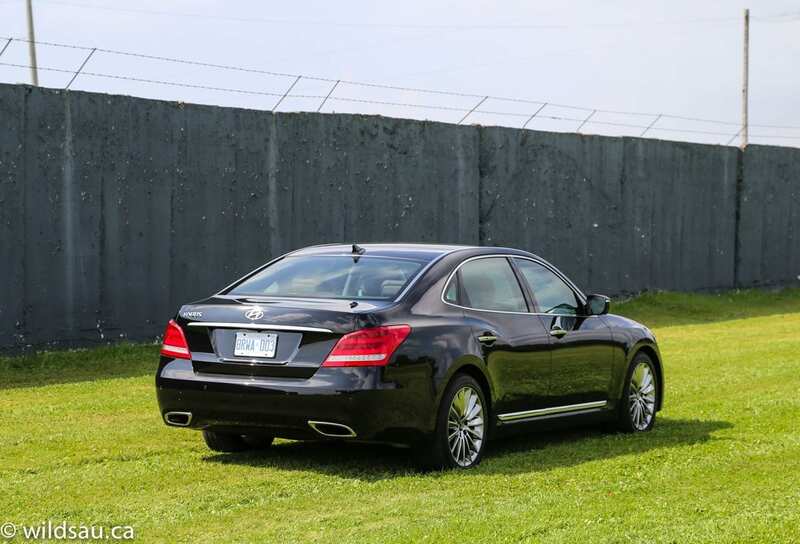 Entertainment is stunning, and that continues on to the rear seating. Oh, speaking of the rear seating, there are wide screens for either side, a control panel to adjust your seat (including massage!) and you can stretch out as if you’re in a La-Z-Boy. Legroom is sufficient for NBA stars. This is a rare car on our streets, but I had the opportunity to speak to a very recent owner just before my trip. He was over the moon with his purchase, giddy with the knowledge that he had all the things cars at twice the price have. 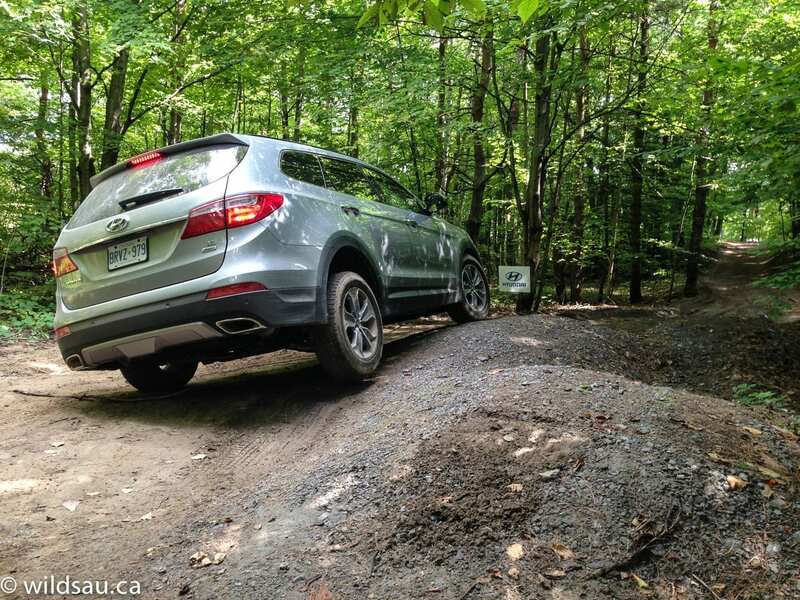 After that, I joined Justin Pritchard, another fellow AJAC member and one seriously hard-working and fun-loving auto journalist, as he took the new Santa Fe XL on a trailering challenge. May I add that this was his first time towing a trailer? Impressively, backing the huge RV trailer into its designated spot only required him to make an 87 point turn. 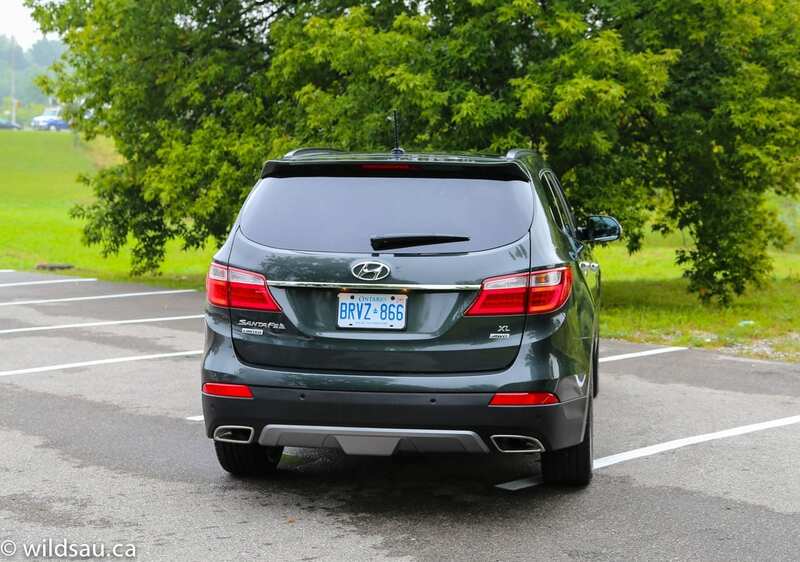 The Santa Fe’s backup camera made a big difference, and after his first try, he parked the whole rig with the ease of a seasoned veteran. The next event I chose was the awesome autocross track. Hyundai set up a fantastic autocross course, and picked their hottest hatch for this portion. The Veloster Turbo, with it’s smokin’ 201 horsepower 1.6-litre turbo 4-cylinder (that is sorely missed in other vehicles in Hyundai’s line-up!) and a manual transmission, was a great tool for the job. It’s not the hardest-edged hatch in the business, but it does a bang-up job at balancing sport, comfort and refinement. Professionally-timed, the autocross was a Top Gear-like parade of egos, pride and testosterone – though the masterful Marie-Eve Côté was near the top of the list all day and stayed there, proving that a set of balls doesn’t mean a thing on the track. I loved that there were no rules. We were allowed nearly infinite attempts to better our time, and the two Veloster Turbos barely ever got a break all day long. Yet, they never complained about the endless tire-squealing, full-on braking and cone-missing swerves they were subjected to. Taking things down a notch, I decided it was time to give the fuel efficiency challenge a shot. 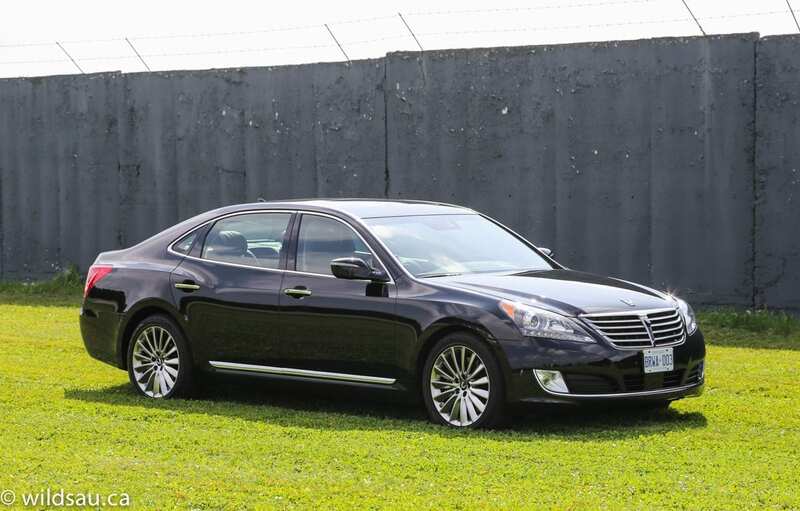 And the Sonata hybrid waiting for me did a spectacular job, shuttling me effortlessly and in near silence through the lush countryside around CTMP. Even after travelling at nearly the speed limit for the entire prescribed circuit, and after big uphill stretches of highway, I managed to average an impressive 4.5 L/100 km (52 mpg!) on my trip. I’m sad to say I didn’t take the challenge. Although I held the podium spot for a while, someone else who is clearly a hyper-miling champion of epic proportions, took home the trophy for his almost-unbelievable 3.6 L/100 km. Did he use all the hyper-miling tricks in the book? Probably. 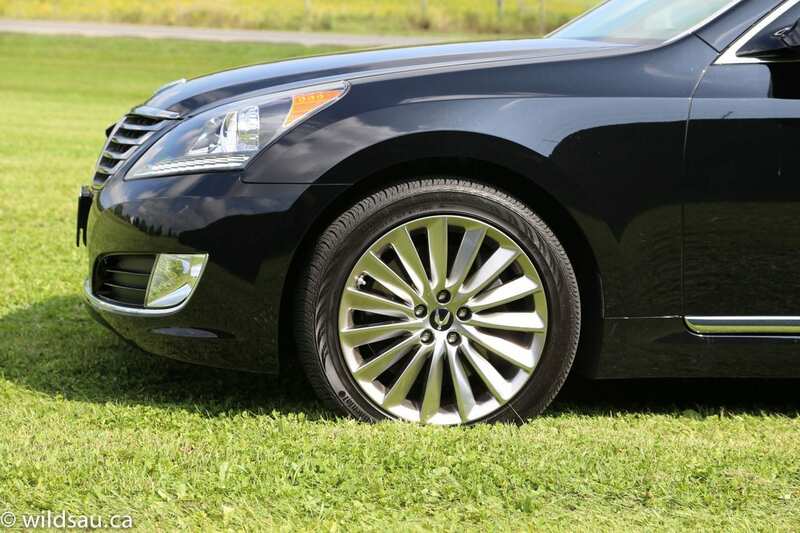 Would you ever drive your Hyundai Sonata hybrid that way on an every day basis? Of course not. But to know the vehicle can achieve 65 mpg under normal conditions is impressive. The time had come for some rough and tumble fun. What’s a Fun Day without some mud?! 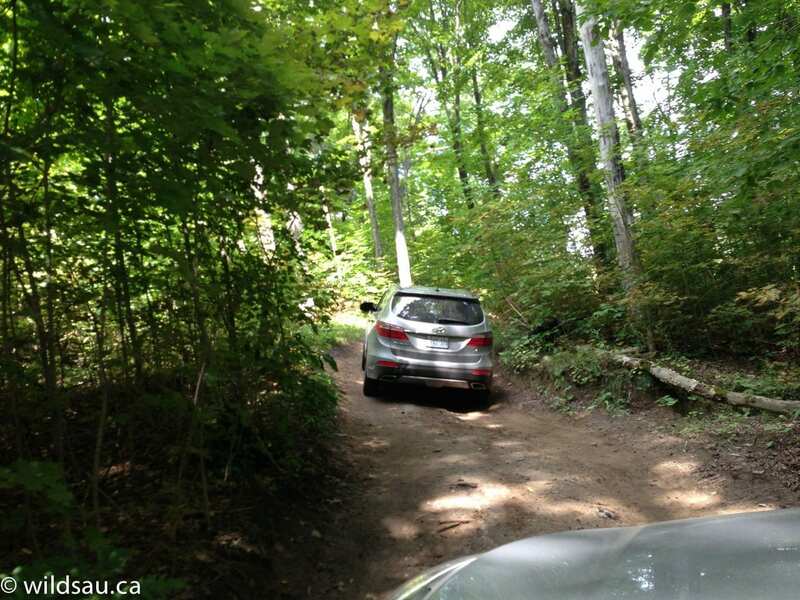 And so we went on a nifty little off-road course in the big Santa Fe XL. 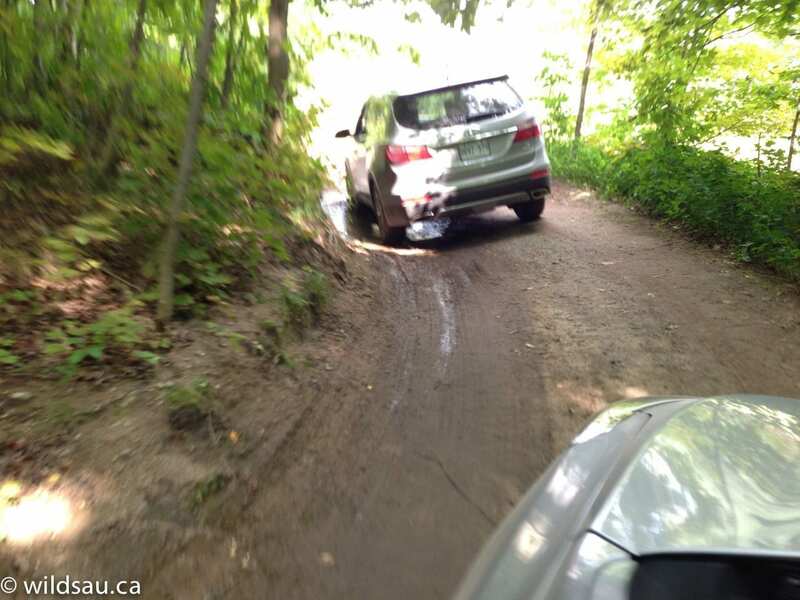 Anyone who goes off-roading on a regular basis would call this soft-roading. But this is likely more strenuous terrain than 99% of all Santa Fes (let’s be honest here, pretty much all SUVs and crossovers) will ever see. Decent little up- and downhill portions, big bumps (occasionally even putting this leviathan up on three wheels), mud, water, tight turns and loose substrate. 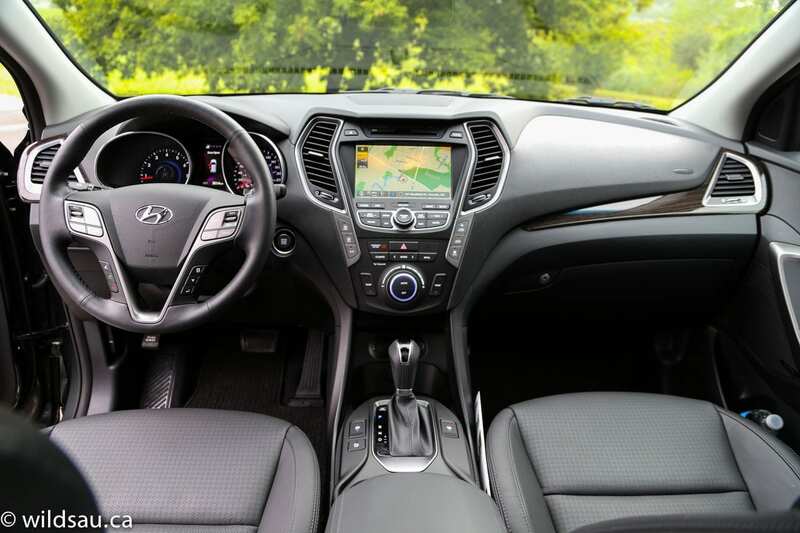 All of it came together to demonstrate that, should you want to or be forced to head off the beaten path in your Santa Fe, you’ll be just fine. It handled the course like a champ. In addition to being capable enough to manage whatever we threw at it, I never heard a squeak or a rattle out of the big vehicle. And finally, the grand-daddy event. 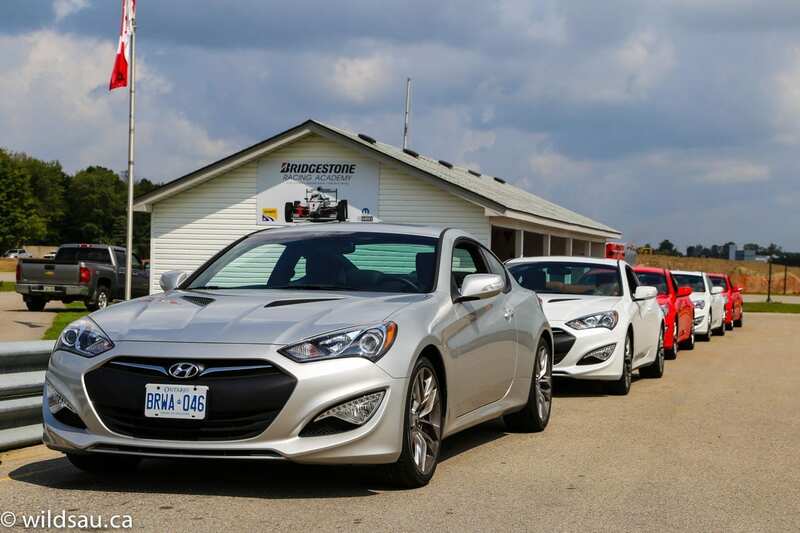 Hyundai brought a bunch of Genesis Coupes out for our enjoyment – to take around the track. Both the 274 horsepower 2.0-litre turbo and the awesome 348 horsepower 3.8-litre V6 models were represented, each doing a very convincing job as a legit track car. They were all 6-speed manuals, upgraded with the R-spec packages. That means specially calibrated suspension, terrific Brembo brakes and limited slip differentials. The 2.0Ts are pretty quiet, all things considered, but the 3.8 GTs sound ferocious under load. And man, were they fun! After a long, hot, tiring and thoroughly enjoyable day, we partnered up again and drove back to Toronto, where we hopped on a plane to head wherever we called home. I loved this day so much – a company that loves to have fun, innovates and builds great products, and remembers to let loose once in a while – what more can you ask for? The Hyundai Fun Day – perhaps the most aptly named press event I’ve ever attended. 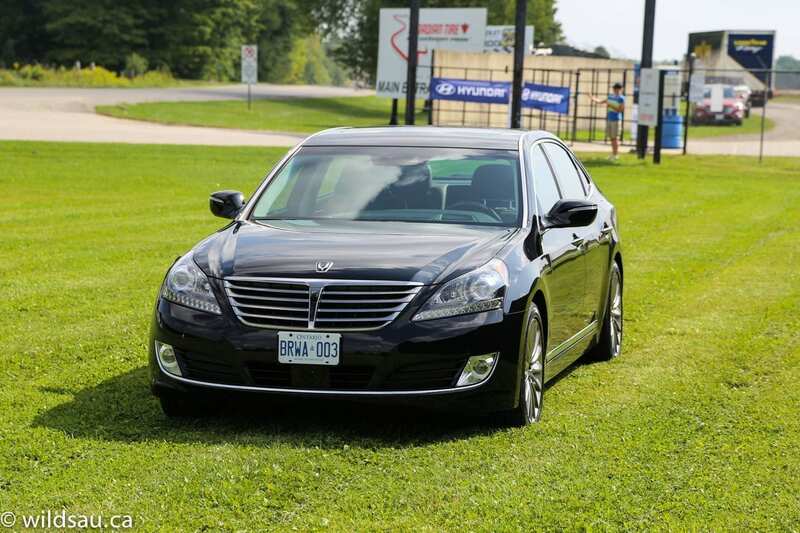 Disclosure: Hyundai Canada paid for my airfare, accommodations, meals and fuel and provided the vehicles for this event.